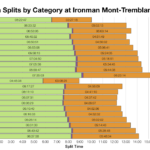 We now move over to Canada for the third Ironman race of the weekend – Ironman Mont-Tremblant. After two fast and flat European courses we’re shifting to a hillier and subsequently slower race. 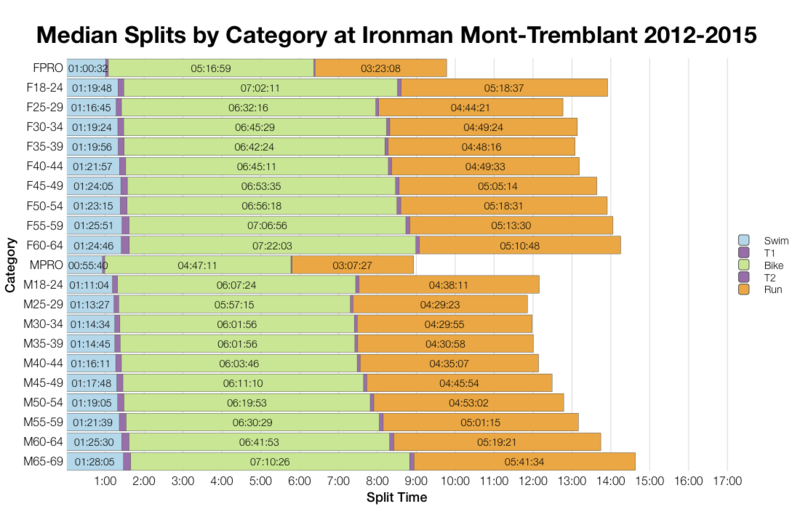 Mont-Tremblant is now in it’s fifth year, it’s a large race with almost 2,500 competitors racing for 40 Kona slots. As with any large race there’s a broad spread of athletes competing and their results fall inline with other North American events. 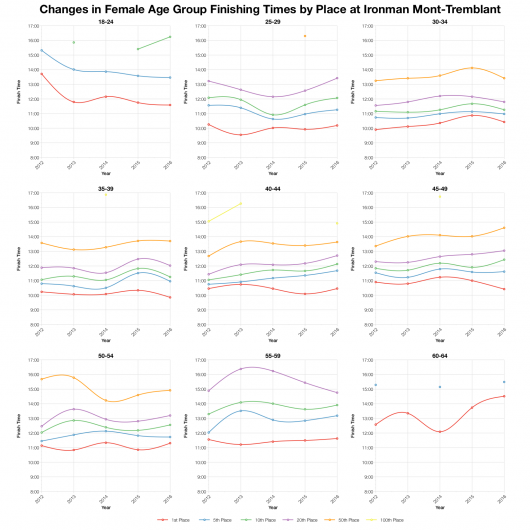 It was a slower year in Mont-Tremblant. In particular times on the swim and the bike fall behind the aggregated results from previous years. The shift appears to be fairly consistent across the field and is enough to see a roughly 15 minute change in overall times. 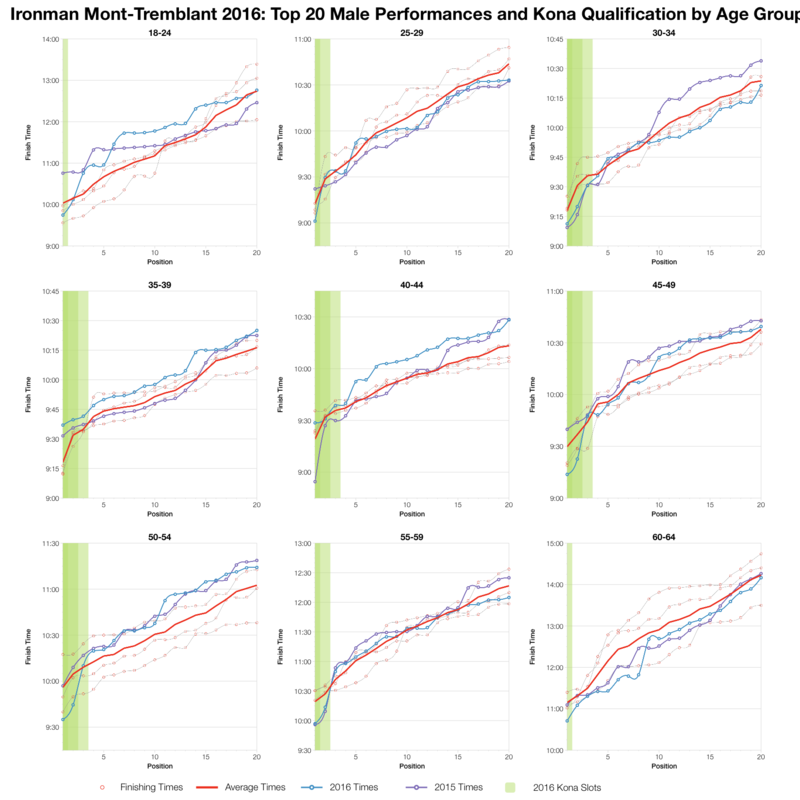 Interestingly, it would appear that since 2013 athlete numbers listed for Mont-Tremblant represent on-site registrations, this means DNS numbers aren’t a major contributor to these percentages. 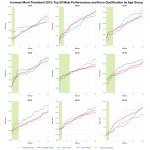 This year’s rate appears to be a bit higher than has been usual (remembering that 2012 numbers contain full DNS numbers pushing up overall figures) and that comes from an increase in DNF on the bike. Combined with the slower bike splits it would appear conditions were tougher on the bike than normal. 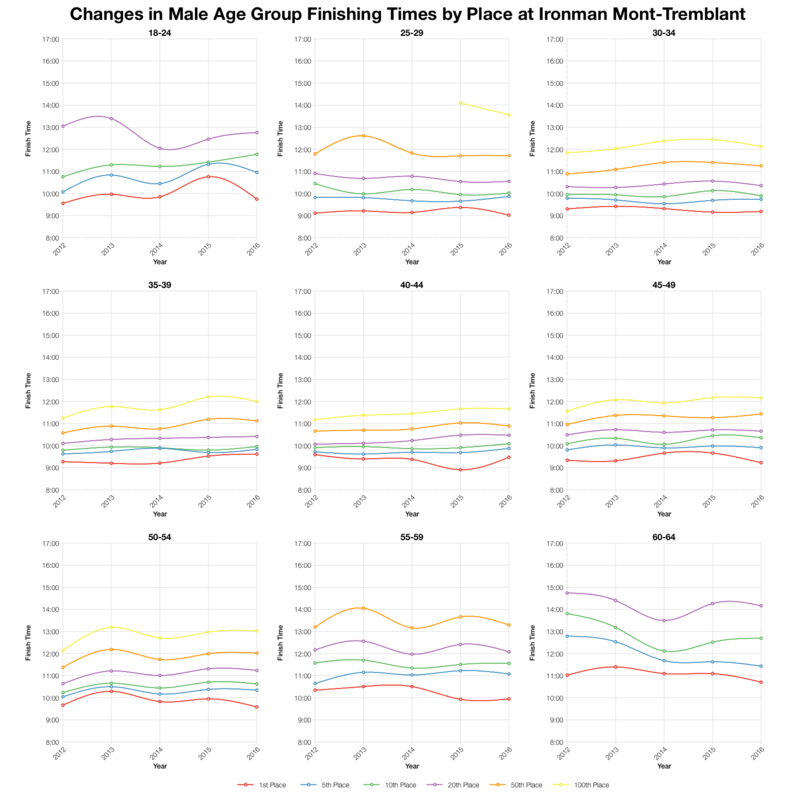 Broadly speaking median times in all three disciplines appear to be slower at this year’s race. 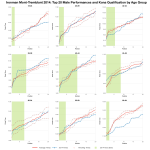 Although, at the individual age group level the changes aren’t hugely significant. A 15 minute shift in overall times can seem quite large, but for a race in excess of 10 hours the differences required in individual elements are relatively small. As we would expect there were mostly Canadians and Americans racing in Mont-Tremblant with a small spread of other nationalities also in the mix. 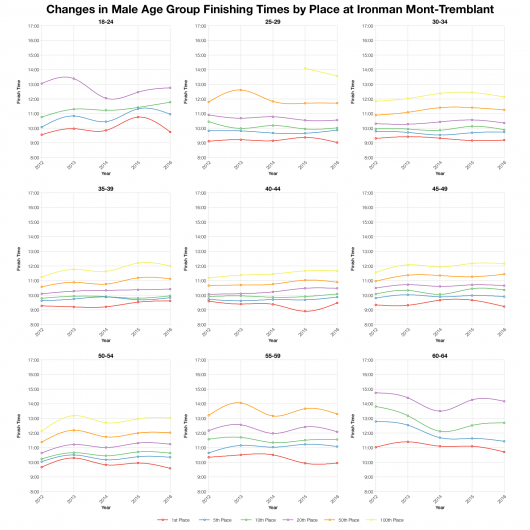 Scanning across the changes in finishing times for different age groups and finishing positions I can’t pick out any clear pattern for this year’s race. It’s a little slower, but not consistently and not by any great degree. 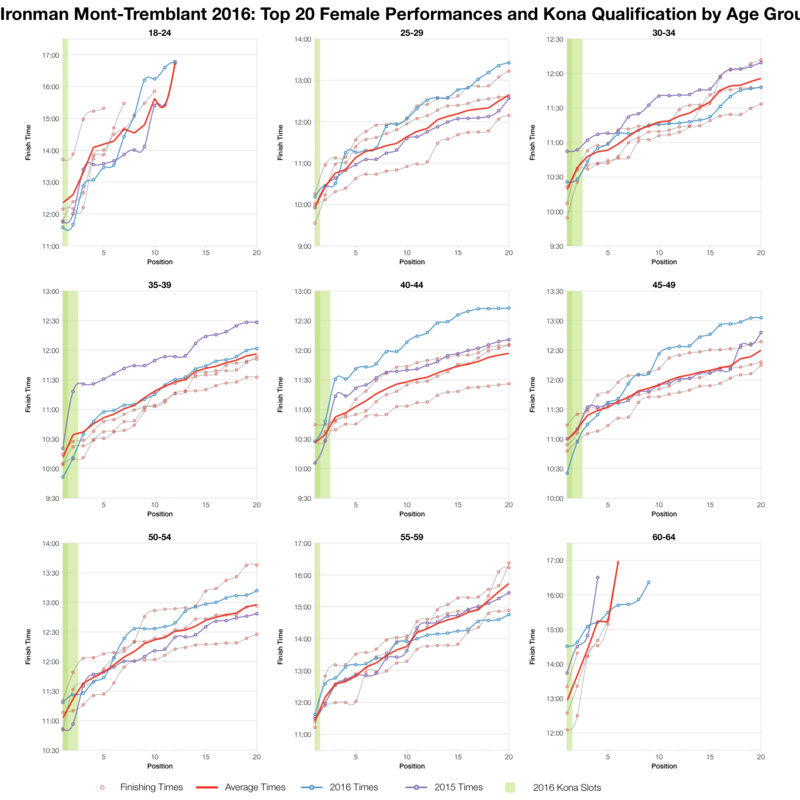 Based on the athlete list I’ve calculated the kona slot allocation and automatic qualifying times for each age group (final numbers may vary). 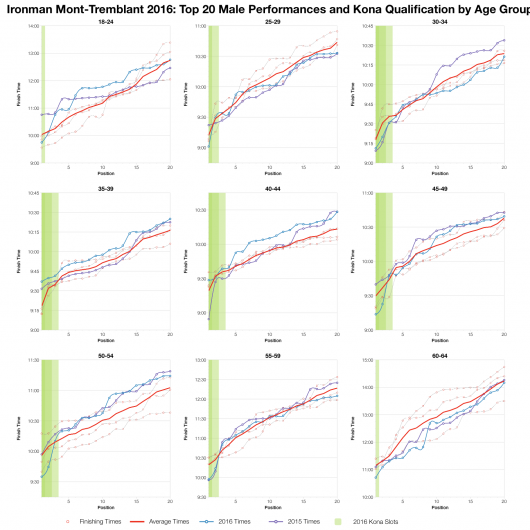 On a course like Mont-Tremblant we won’t see the sub-9 qualifying requirements of Sweden or Copenhagen, but for a hilly course there are some fast performances at the front. 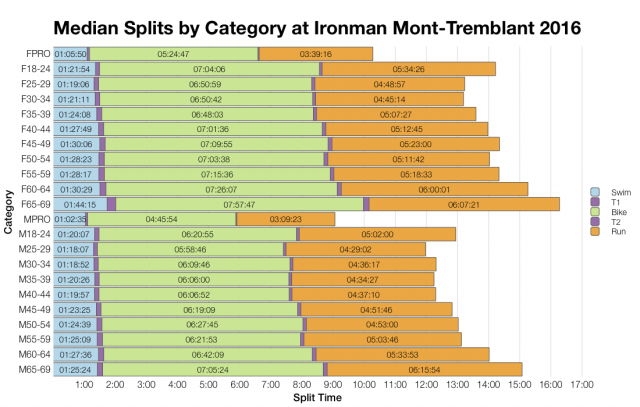 You can compare Ironman Mont-Tremblants qualifying times with other races on my Kona qualification page. 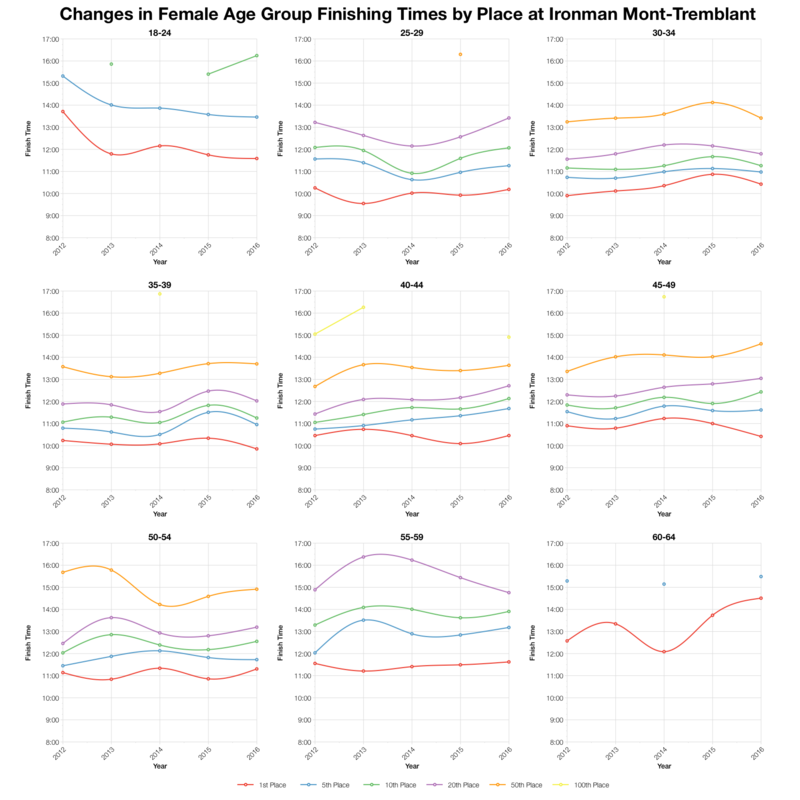 Finally, looking at finishing times for the top twenty in each age group, this year’s results are generally average to below average. 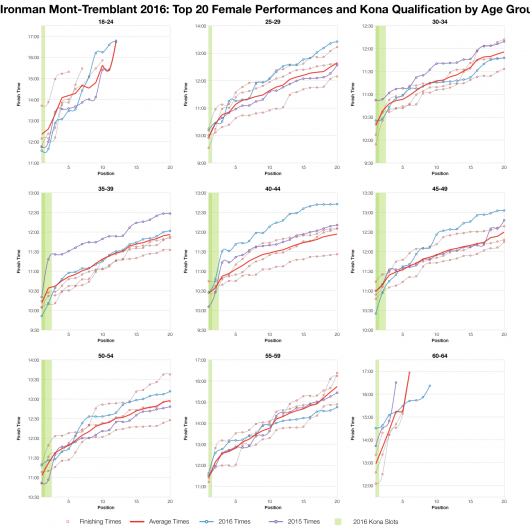 There are quite a few instances where Kona qualifiers outpace the average and set some very fast times for the course, but for the most part the front of pack follows the trend of a slightly slower race in 2016. 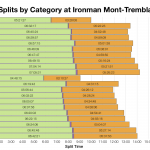 You can access a spreadsheet of the full results and splits from Ironman Mont-Tremblant 2016 on my Google Drive.